The phones and tablets that we carry constantly transmit a steady stream of information to third parties. Our searches, shares, and messages represent only a fraction of the sensitive, private, and identifiable data that our devices generate. The data includes many ‘identifiers,’ ranging from a serial-like IMEI number that is unique to each handset to unique operating system identifiers and even location information. Some of these identifiers are personally identifiable and ‘baked in’ to the devices we carry around with us, while others are created as we use apps or browse the Internet. Moreover, many of these identifiers are transmitted and collected without notification to users, ending up with third parties, including app developers and advertising partners. The constant transmission of identifier data is important to delivering seamless and tailored services and content to users. However, the uniquely revealing nature of identifiers, combined with the inconsistencies in how they are collected, transmitted, and secured, raise serious security and privacy concerns. Describes key identifiers for mobile devices. Highlights some identifiers that are accessible, and often collected, by various parties. Highlights the risks associated with the widespread transmission and use of these identifiers. Mobile devices are assigned many identifiers that are used by hardware manufacturers, telecommunications service providers, operating system manufacturers, advertisers, and application developers. The identifiers are used to register devices to mobile networks, to ensure that operating systems operate smoothly, and that applications work correctly. They can also be used to facilitate user tracking, and for targeting advertising. There are a set of ‘hard baked’ identifiers associated with different components of mobile devices. The various radios that are integrated with the device, such as those associated with cellular, wireless, bluetooth, and near field communications, are all assigned unique Media Access Control (MAC) addresses. The MAC address is assigned to a radio, although it can sometimes be rewritten using software programs. The MAC address of the device’s Wi-Fi chip is typically broadcast when Wi-Fi is enabled and the device is searching for access points. The International Mobile Equipment Identifier (IMEI) is tied to physical devices and remains the same throughout the life of the device. The IMEI denotes the standards board responsible for assigning the identifier, the time that it was manufactured, the serial number issued to the model of the device, and the version of the software installed on the phone. MIN / MSIN The Mobile Identification Number or Mobile Subscription Identification Number uniquely identifies a mobile device to a carrier. The number is included in the IMSI as an important identifier. SIM The Subscriber Identification Module identifies and authenticates the phone and user to the network, has a unique serial number, and holds substantial information about the user. IMSI The International Mobile Subscriber Identification number uniquely identifies the user. Device IP Address With mobile data, devices are typically assigned a network IP address. MSISDN The Mobile Subscriber Integrated Services Digital Network number includes the caller’s phone number, and uniquely identifies a particular subscriber’s SIM card. The operators of communications networks, like mobile carriers (e.g., AT&T), or the operators of a Wi-Fi connection (e.g., coffee shops), can read a range of identifiers from devices. In the case of carriers, they also assign their own identifiers. Mobile service operators typically assign identifiers that register subscribers to cellular networks. The Mobile Identification Number (MIN) or Mobile Subscription Identification Number (MSIN) are used to uniquely identify a subscriber. A Subscriber Identification Module (SIM), commonly referred to as a “SIM Card,” includes information about which carrier is associated with the module, its time of manufacture and other carrier-specific information, as well as a serial number uniquely linked with the SIM itself. The SIM is identified to the network with an International Mobile Subscriber Identity (IMSI) number2, which in turn identifies the mobile country code, network code, and mobile subscription identification number. In the case of cellular data, a network IP addresses is also assigned to the device. Using identifiers like the IMSI, cellular operators typically collect geolocation records of mobile devices movements based on proximity to cellular towers. They also collect billing and usage information (e.g., websites visited, numbers dialled out, numbers dialled in, messages sent and received, etc.). In comparison to cellular providers, Wi-Fi operators tend to issue or require fewer identifiers. Wi-Fi operators will most commonly assign IP address information, though they may also require authentication credentials in order to log into the Wi-Fi hotspot. However, it is difficult to generalize about the practices of Wi-Fi operators, as they have widely varying policies about collecting and retaining data transmitted by users’ devices. Importantly, communications network providers (both mobile and Wi-Fi) are often able to read, retain/log, or make decisions based on the identifiers and data that are transmitted on their networks. For example, a communications provider can watch for the identifiers linked to a physical device as well as the identifiers associated with operating systems and applications. After reading the identifiers, they can log the presence of the identifiers for billing or marketing purposes, as well as make decisions whether or not to provide the device with service. Android Identifier A unique number generated when the operating system is first run that can be used to track users. Google Wallet & Apple Pay Payment services linked to both devices and accounts. Mobile operating system developers, such as Google, Apple, Microsoft, and Blackberry, can also include identifiers that assist users in operating their devices and provide resources to developers responsible for creating applications for the respective manufacturers’ operating systems. Android devices, for example, have the Android Identifier that is generated the first time a newly installed Android OS is booted.4 Previously, Apple devices both used and shared a UDID (Unique Device Identifier) with applications. After privacy and security concerns were raised by researchers and the press, Apple introduced a separate number in more recent versions of iOS that is called the Identifier for Advertisers (IFA). The IFA (which can be disabled by a device owner) lets advertisers track user behavior across activities. Sometimes operating systems providers will prompt users to generate new identifiers or credentials, such as a new Google account, Microsoft Live account, or AppleID. A growing number of companies, including Google (Google Wallet) and Apple (Apple Pay) are also integrating mobile payment services with near field communication options built into devices. In addition, mobile carriers sometimes integrate these payment options with mobile app stores, like Google Play or the App Store. Users may also be asked to provide ‘crash’ information to the operating system manufacturer, and such information may contain details about the user’s device and their usage of it. Applications may also request access to sensor (e.g. accelerometer) or communications data, such as GPS, Wi-Fi, or SMS information. Applications can also request user data, such as contacts and files. Still other applications request a wide range of information from user devices, not all of it clearly aligned with the advertised functionality of the app. Even if the application itself is only using the “necessary” permissions for functionality, advertising networks included in the application may be “piggy backing” on the permissions requested by the app in order to access identifying data. Access to these pieces of data is typically referred to as ‘permissions’; only once a user or device owner has permitted the application to read this information does it gain access to the requested sensor, user, or communications data. 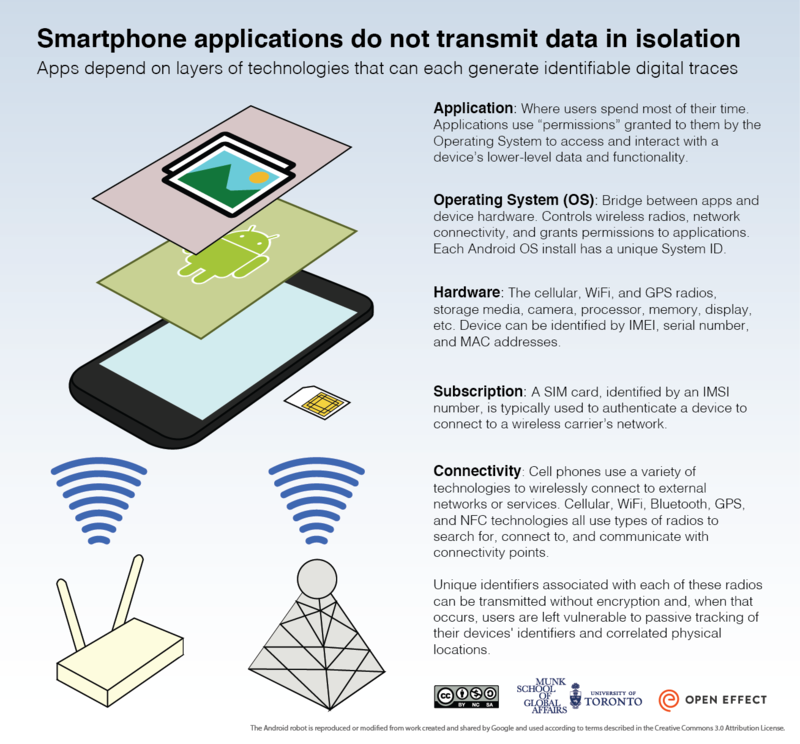 Surveys of mobile device applications have shown that applications request access to more information than they require to perform their stated functions (e.g., a calculator application requesting access to geolocation, SMS, and call log information). Such overbroad requests for data on mobile devices create privacy problems, including: the user may not know that personal data is shared; the app developer may share data with third parties; the data may not be transmitted securely; and, the data may not be stored securely. Who can access what on a mobile device? The range of identifiers discussed previously are not accessible to all of the different parties involved in facilitating and enabling mobile device-based communications. Table 4 provides a general summary of the kinds of data available to each party. However, given the complexity of the ecosystem it is difficult to generalize, and there is likely to be variation in specific cases. Cellular providers typically possess a wide range of information about you; in addition to the identifiers, denoted in Table 4, they may have payment information for post-billing purposes, government identification information when that kind of information must be provided to receive a SIM card, credit information, and more. These additional kinds of information may be needed to satisfy business or regulatory requirements. The provider of the Wi-Fi network to which a device is connected can capture and read unencrypted data traffic, such as unencrypted web traffic. This type of provider can also determine information about a device connected to the network by analyzing transmitted user-agent strings, the device’s MAC address, or any identifiers that application or mobile operating system developers transmit in plaintext. The developers of major operating systems, like Android, have access to a wide range of information about the device. For an Android device to regularly receive updates it must be tied to an account, such as the Gmail account required to access the Google Play Store. In addition to the exceptionally wide range of information about the device that this access provides, many of the bundled applications on phones, including maps, provide a rich stream of location information back to the operating system manufacturer. The design principles integrated within mobile operating systems vary considerably, with consequences for how much of a user’s communications the vendor sees. For example, on Android, Google Hangout messages are accessible to Google in an unencrypted format, whereas iMessage communications on iOS are encrypted end-to-end, blocking Apple from easily reading the messages. Despite these differences, vendors still receive substantial information about users via avenues like mobile account backup and recovery, updates, map applications, and activities on app stores. Finally, while tremendous variation exists across handset manufacturers, major manufacturers also have avenues for access to identifying information about users. For example, some major manufacturers offer ‘find my mobile,’ backup services, and updates. Some previous reports have highlighted privacy and security concerns with these services, including cases where personal user data was apparently sent without encryption. Application developers can access a range of identifiers in the course of providing their services. Many mobile operating systems will reveal which identifiers an application seeks to access, such as phone dialing information, SMS messages, or the device’s GPS; these possible permissions are noted in Table 4. In addition, developers may partner with advertising networks or other third parties, and share their users’ identifiers or personal information with these other parties. As a result, in addition to the apparent collectors of identifiers (i.e. app developers) there are largely hidden collectors, such as those belonging to advertisers and analytics or crash report companies. The many identifiers assigned to our devices form a key part of the operations of mobile and wireless networks. However, a range of vulnerabilities can be exploited by another category of actors: third parties who seek to track or monitor the communications of device owners. For example, security flaws in the design of the global telephone system enable third parties to silently track the location of any mobile number anywhere in the world, as well as snoop on user activities. At a more local level, businesses are increasingly monitoring the movement of shoppers and foot traffic near and within their stores; some companies use the Wi-Fi MAC address, signal strength, and other mobile device characteristics to identify customers as they browse stores or walk in retail areas. Some attempts have been made by manufacturers to reduce the identifying characteristics of Wi-Fi connectivity by randomizing MAC addresses, but with mixed results. Governments throughout the world make extensive use of the vulnerabilities and privacy deficits associated with mobile communications to conduct both targeted and widespread surveillance. We know from a recent case in Libya that the Gaddafi regime leveraged tracking and monitoring on the mobile network as a potent tool for control and repression. Moreover, state-level actors have also hacked SIM card manufacturers’ systems to collect encryption keys, and can collect IMSI and IMEI numbers alongside phone call information. At local levels, some authorities use ‘IMSI-catchers’ to create fake cellular towers for targeted monitoring. As nearby cellular phones connect to these fake towers, users can be identified and their calls and messages monitored. The mobile ecosystem is complex and multi-faceted, making it challenging for ordinary users to evaluate their security and privacy risks. Even security conscious users find it difficult to control the communications from their devices. This working document is intended to highlight only one part part of this environment: the many unique identifiers that are regularly transmitted from our devices. We welcome feedback and input, and hope to update the working document in the future. 2 To limit transmission of the more sensitive IMSI number, the network uses a temporary number (the Temporary Mobile Subscriber Identity) for most periodic updates. 3 Apple still has access to the UDID; the IFA was developed to reduce Apps access to the UDID while providing tracking information to advertisers. 4 A factory reset results in a new Android Identifier. 5 When a user visits a website, the user’s browser sends a string of text (the ‘user agent identification string’) to the requested web server identifying the user’s web browser, browser version number, operating system and other details about the user’s system. 6 Depending on the OS, apps would typically need to request permissions for this access. 7 In jurisdictions where enhanced emergency calling is being rolled out some providers may be able to access your device GPS output when you make an emergency call. 8 In some cases carriers provide mobile payment options, e.g. Google Play, for online services.